It's been a busy year for the Cold, one that began modestly and is ending with their being the most popular rock band New Orleans has spawned in years. In December 1979, original Cold guitarists Kevin Radecker and Bert Smith were joined by bassist Vance DeGeneres, organist/vocalist Barbara Menendez and drummer Chris Luckette, who had just left the now defunct Normals. It was a major overhaul, and one that promised remarkable strides. delights in unveiling new material, usually without warning. the Cold once again demonstrated that they have made it by eschewing the fulsome lead guitar and synthesized drudgery that plague lesser bands. 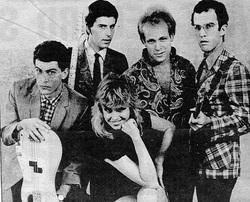 Songs, including splendid cover versions of the Easybeats' "Friday on My Mind," the Dave Clark Five's "Glad All Over" and the Beatles' version of the Isley Brothers' "Twist and Shout" are emphasized more than anything else, except for the effervescent ensemble work that has become the band's trademark. Other early aspects of the group's performances - such as the Radecker-Smith guitar tandem, Luckette's and DeGeneres' formidable rhythmic volleys, Menendez's unrelenting charm and the fact that all five members sing - also are still intact. There was even a moment of nostalgia, as two other original members of the band (from when it was Totally Cold), drummer Ron Blanchard and "Rockin'" Rick Connick, sat in for a couple of numbers. Like everyone else in the band, Bert Smith seems happy about the way things have turned out. "It's been kind of surprising," he said. "We did our first gig, as Totally Cold, in July 1979, on the same day that Skylab crashed to earth and Hurricane Bob passed. We always felt that we were tapping something that people were starved for, which was Merseybeat." DeGeneres, too, could find little to complain about. "I've been extremely happy," he said. "For a year, things have gone well. The crowds have gone from averaging about 150 to around 800 now. That's got to say something. I guess the high point of the year was getting the record played on commercial radio," he said of "You", the single which recently made the playlist of WTIX, making it the first locally produced new record by a local band played on the station in nearly four years. "Of course, WTUL always helped us, but the high point was getting into my Volkswagen and hearing it on "TIX". "We just finished mixing down our next single," said Smith. "It will be 'Memories', Chris Luckette's old song from the Normals, and 'Mesmerized' which Barbara sings. The mix I heard sounds big - almost like Phil Spector. At least it sounded big on the studio speakers." "The thing about the band," said DeGeneres, "is that not everybody is a great musician. Everybody's come a long way, and we all have the same thing in mind. We're just trying to get a record contract and put out a decent first album. But that doesn't really guarantee us anything. One thing I don't like is that some people have accused us of doing stuff that is too pop and not complex enough", he said of their material. "They'd like us to do something with synthesizers. But the pop stuff is just what we like. I've always written this way, and I'm not about to change my style. We've got about 30 originals now. I'm pleased with the quality. We had about eight or nine originals when we started. There are some songs we don't do anymore, and a few that could be eliminated." Smith adds: "We still do a lot of cover versions because of new audiences. It takes them a while to get used to us. We don't mind doing other people's songs, such as 'Friday on My Mind.' As for complexity, I think we have very complex material. Kevin and I have become much better guitarists, and with Chris and Vance in the band things are very complex. Especially with Chris, who is always coming up with different rhythms." "After all, I've never heard another band do a Cold song."